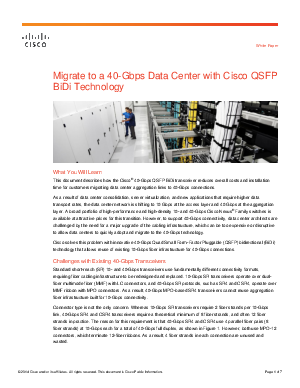 This document describes how the Cisco® 40-Gbps QSFP BiDi transceiver reduces overall costs and installation time for customers migrating data center aggregation links to 40-Gbps connections. As a result of data center consolidation, server virtualization, and new applications that require higher data transport rates, the data center network is shifting to 10 Gbps at the access layer and 40 Gbps at the aggregation layer. A broad portfolio of high-performance and high-density 10- and 40-Gbps Cisco Nexus® Family switches is available at attractive prices for this transition. However, to support 40-Gbps connectivity, data center architects are challenged by the need for a major upgrade of the cabling infrastructure, which can be too expensive or disruptive to allow data centers to quickly adopt and migrate to the 40-Gbps technology. Cisco solves this problem with innovative 40-Gbps Quad Small Form-Factor Pluggable (QSFP) bidirectional (BiDi) technology that allows reuse of existing 10-Gbps fiber infrastructure for 40-Gbps connections.